Lots of people know DuckDuckGo as the privacy-focused search engine. Whether you like DuckDuckGo because you’re sick of Google Stop Using Google Search: Here's Why Stop Using Google Search: Here's Why Google has unrivaled access to your browsing habits. Giving everything to Google isn't such a good idea. Here are some excellent Google alternatives that still get the job done. Read More or just love its cool bang feature 25 Cool DuckDuckGo Bangs That Make Google Search Look Slow 25 Cool DuckDuckGo Bangs That Make Google Search Look Slow DuckDuckGo's bang feature is one of its most time-saving and handy tricks. Here are 25 useful DuckDuckGo bangs to get you started! Read More , there are plenty of reasons to check it out. 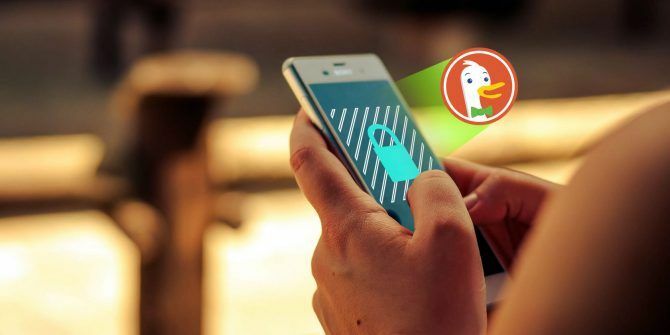 Now here’s another: DuckDuckGo just launched updated browser extensions and mobile apps to help keep you safe and your data more private online. Let’s take a look at what they offer. DuckDuckGo offered browser extensions prior to this major update, but they were pretty basic. They set your default search engine as DuckDuckGo and allowed you to quickly access the website to search, but not much else. Now, the new extension called DuckDuckGo Privacy Essentials has a lot more to offer. Install it in your browser of choice, and DuckDuckGo protects you in a variety of ways. The first, and most obvious, change you’ll notice is that the extension sets your default search engine to DuckDuckGo. Unfortunately, due to the way that Chrome handles extensions How to Clean Up Your Browser Extensions (The Easy Way) How to Clean Up Your Browser Extensions (The Easy Way) If you regularly check out cool extensions, then it is probably time to clean up those add-ons that you no longer want, like, or need. Here's how to do it easily. Read More that modify your default search engine, you can’t change this setting without completely disabling the extension. Firefox doesn’t have this problem. You can change the search engine Which Search Engine Should You Be Using Today? Which Search Engine Should You Be Using Today? There are many search engines out there, but which one is the best for you? Read More after installing and the extension will work fine. Of course, if you’re interested in the privacy that DuckDuckGo offers, you probably don’t want to search with Google regularly anyway. When you’re clicking around the web, it’s easy to forget that most sites don’t take your privacy seriously How Advertisers Use Web Beacons to Track You on the Web and in Emails How Advertisers Use Web Beacons to Track You on the Web and in Emails Have you ever wondered how advertisers track you around the web? There are many methods, but the use of web beacons is one of the more common and effective. Read More . To address this, DuckDuckGo’s new extension offers a privacy score for every website you visit. You’ll see it displayed as the extension icon in the upper-right corner of your browser and can click it to see more details. The lowest score is F, while the best is an A. Click a site’s score in the dialog box, and you’ll see more details on why it received that score. If some feature of the DuckDuckGo extension improves the privacy score, you’ll see that reflected here. 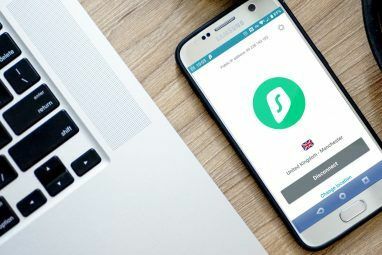 For instance, if the add-on blocks a major tracking network or forces an encrypted connection, the score could improve. If you’ve ever wanted to see exactly who’s tracking you online, you can get a peek with this extension. Click the X Tracker Networks Blocked entry on the dialog and you can see what’s embedded into the website. You’ll see a lot of Google and social media sites here. DuckDuckGo’s extension also forces encryption to websites where available. Like the HTTPS Anywhere extension Completely Secure: 11 Must-Have Firefox Addons For Security Completely Secure: 11 Must-Have Firefox Addons For Security Think about the browser you're using to view this article right now. Is it safe? Is it secure? You'd be surprised by those answers. 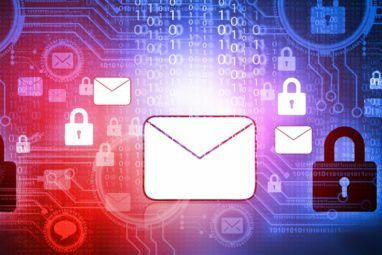 Read More , this enables a secure connection if a website offers it. Rounding out the extension’s features are a DuckDuckGo search box and a Site Privacy Protection slider. Disable this to whitelist a site and the extension won’t run on that domain. This is useful if you find the extension breaks some sites. For increased privacy on the go, you should also take a look at the revamped mobile apps from DuckDuckGo. Like the browser extension, the mobile apps do most of their work in the background. Open it up, and you’ll get a simple DuckDuckGo search page to find whatever you’re looking for 8 Search Tricks That Work on DuckDuckGo but Not on Google 8 Search Tricks That Work on DuckDuckGo but Not on Google Google Search is king. But DuckDuckGo has earned a loyal fan following. It has a few unusual features that even Google doesn't have. Read More . You’ll see a privacy score for every website in the top bar that you can tap for more information. The Fire icon in the menu bar lets you instantly erase all your browsing data How to Delete Your Browsing History on Android How to Delete Your Browsing History on Android You may often delete browsing history on your computer, but that isn’t the only thing you need to worry about. Read More and close your active tabs. However, we couldn’t find any way to open a new tab in our testing, and there’s no history menu. This button makes it easy to “reset” the browser, but we’re not sure what exactly it’s deleting. DuckDuckGo’s mobile browser rounds out with a basic bookmark function so you can easily jump to your favorite sites. Overall, the DuckDuckGo browser isn’t full-featured enough to become your default. However, it’s a good idea to keep it around for when you want to search something without being tracked. Opening DuckDuckGo to search for sensitive medical How to Research Health Issues: The Best Alternatives to Dr. Google How to Research Health Issues: The Best Alternatives to Dr. Google Is Google a reliable source for researching health issues? Can you trust it? If not, which are some of the most trustworthy alternatives for health related information? Read More or personal questions is worth it. Are DuckDuckGo’s Apps and Extensions Worth It? Overall, DuckDuckGo’s new browser extensions and mobile apps are solid offerings, but not anything groundbreaking. This is accurate. DuckDuckGo’s extension combines the forced encryption of HTTPS Everywhere, the tracker blocking of apps like Disconnect, and private search. If you like having one extension that does it all, you might prefer to install this one instead of three separate extensions to get the same effect. The mobile app is bare-bones but effective. Firefox Focus offers a similar package Firefox Focus Blocks Ads and Trackers By Default Firefox Focus Blocks Ads and Trackers By Default Firefox Focus blocks ads and trackers by default, ensuring you can browse the web without fear of your every action being analyzed. Which is unfortunate for us. Read More with more features that you might prefer. And the company’s note about private browsing is right: websites can easily track you even using private or incognito browsing 4 Ways You Can Be Tracked When In Private Browsing 4 Ways You Can Be Tracked When In Private Browsing Private browsing is private in 99% of cases, but there are many ways in which it can be circumvented, thanks to browser extensions and hacks. Some of them don't even need all that much work. Read More . If you’re really privacy-conscious, you should skip these extensions and install a completely private web browser 4 Anonymous Web Browsers That Are Completely Private 4 Anonymous Web Browsers That Are Completely Private Surfing the web anonymously is one way to protect your online privacy. Here are the best anonymous web browsers to use. Read More . Will You Try DuckDuckGo’s New Apps? We’ve seen what DuckDuckGo’s new apps set out to accomplish and how they work. If you’re a DuckDuckGo fan, give them a try and see if you appreciate what’s new. But if you already use a privacy extension or browser and are happy with it, there’s not much reason to jump to DuckDuckGo’s new offering. Regardless, it’s great that this privacy-focused company is improving its products! For more privacy on the go, check out the best Android apps to protect you 8 Great Android Apps That Protect Your Privacy and Security 8 Great Android Apps That Protect Your Privacy and Security If you want to keep your Android device safe and secure, we recommend these apps. Read More . Have you tried any of the new DuckDuckGo apps? What do you think of them? Share your favorite privacy apps and extensions down with us in the comments! Explore more about: DuckDuckGo, Online Privacy. Woud love to see a compare/contrast article between DDGo and Startpage.